When a person is seen wearing labels like Chanel, Dior, or YSL it isn’t only a status symbol but also a sign of great taste and impeccable quality. We have come to admire, love and in many ways obsess and worship these designer names. It’s as though the brands have become exclusive members-only clubs where you’re only granted membership with a purchase of a purse or a pair of shoes, that comes along with a very hefty price tag. Some go as far as blowing away a month’s worth of hard earned pay just to be an insider. A huge reason for this overpowering need to belong and obtain the labels comes from what we see in the media on a daily basis. Our favorite actors and actresses are constantly appearing in glamorous gowns and fine tailored suits on magazine covers and the TV circuit. What most of us don’t realize is this is part of a well thought out plan for all the designers to get us into their stores. The beautiful dresses and outfits we see on the red carpet, most of the time, are part of the designer’s Haute Couture collection which comes out once a year and are loaned to the starlets for major events. Haute Couture started in Paris and is defined as high-end dressmaking. It’s what the designers use to grab attention and create a lasting impression in the minds of the consumer. 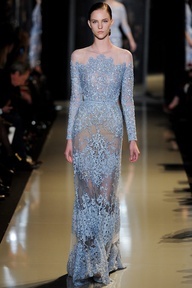 The price tags for some of the couture dresses can go as high as $100,000. Why so high you ask? Couture clothing is one of a kind custom pieces that are put together out of the best quality fabrics and materials and are sewn entirely by hand. It takes teams of people and many hours to create these masterpieces. During this year’s Spring 2013 Valentino Couture show we saw a lot of hand painted organza dresses and separates which were beautifully embroidered with flowers and butterflies. One jacket and skirt, alone, took 850 hours to embroider. The crepe piping that was elegantly placed all over dresses took 500 hours to roll. The production of collection even caused one of the workers to develop carpal tunnel syndrome. Blood, sweat and tears go into making every single detailed inch of this clothing. Once finished the pieces are looked at as art and it’s this very art that puts designers on the fashion map. Just like every other season, this year’s Spring/Summer 2013 Paris shows did not disappoint. The designers showed off their A-game. Some of the best collections this year come from Christian Dior, Valentino, Elie Saab, and Chanel. Dior showed a variety of bright colored and floral silhouettes giving off feelings of spring’s blooming gardens. 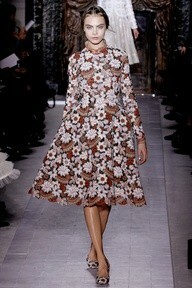 That is the exact theme Raf Simone, current Creative Director of Christian Dior, was going for. His inspiration came from Mr. Dior’s love for gardening. Strong angles and the implication of pockets in almost every piece gave the collection a modern edge. Short pixie cuts and bold colored lips on models added the final touches for a strong liberal feminine woman.Elie Saab displayed his usual whimsical fairy tale goddess gowns. The perfectly placed embroidery and beading, decorated demure necklines, and long sleeves as the dresses weightlessly flowed down the runway. Karl Lagerfeld played with shoulder emphasis in his Chanel collection. His goal was to bring attention to the beauty of a woman’s neck, showing it as almost swan-like. The neo-classical inspired pieces had a variety of shoulder styles with everything from strong armor to fichu. Once the latest creations are seen on the runway, the world’s stylists rush to get the best picks for their celebrity clients. And it just so happens that the couture shows take place right around the time of award show season creating a who wore what on the red carpet frenzy. It’s true what they say, art is in the eye of the beholder. For some art is going to museums and looking at paintings and sculptures, for others it may be flipping on the TV and admiring the latest red carpet fashions.